One year old x 2! Here are my babies, getting warmed up for a day of birthday fun! I can’t believe they are a year old already, and we are all still alive! Hurray! Happy Birthday Titus and Chloe!!! 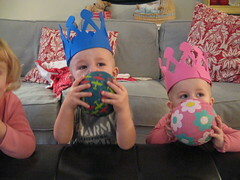 It *is* an accomplishment to make it through the first year with twins – twice the thankfulness, in fact! Our 2 Christmas girls will be 5 this year! I love the crowns. I can just imagine a birthday celebration in your home. An abundance of fun and laughter I’m sure. Merry Christmas!